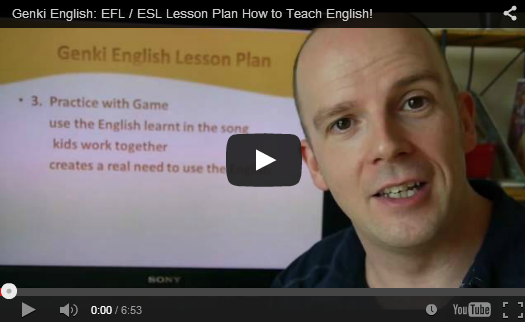 If you’ve picked up your Teacher’s Set then this is how you can use them to get some awesome ESL (English as a Second Language) or EFL (English as a Foreign Language) lessons! I also did a video of this if you’d prefer learning that way. The very first lesson is easy with the Disco Warm Up to set up the expectations and the all important first steps of discipline and getting the kids excited, but still under control. Then from the second lesson we start reviewing everything we’ve done so far, this is the real key that gets the big results. You can see how I do it in video here. Then we need some sort of input of new materials. You could do this the old fashioned flashcard-repeat-after-me type thing, but the research shows that doesn’t work too well, and it’s as boring as anything! So that’s where the computer games and the special songs come in to play, this is how you get the grammar and vocab well and truly stuck in their heads. Ninja Trick: The key here is “multiple intelligences” so that’s why we have big, bright, unambiguous (but sometimes a little weird!) pictures, fun sounds, plus melodies and gestures for everything. This hits as many of the different ways of learning as we can (hey, smell would be cool too! 🙂 ) so all the kids have a chance to learn & remember. If you skip a few (say you don’t like gestures or don’t like music or computers) then you’ll miss some kids! Ninja Expert Level Trick: Try doing the computer game *before* you do the words. Let the kids learn the vocab from the computer game not from you. This feels very weird for a teacher but gets amazing results. Then just check the meaning with the words and do the mini lesson, song as above. A lot of courses miss this out and that is why you find lots of kids who study for years but can’t speak at all. Speaking is the most important part of learning a language, and it can be terrifying! So that’s why in Genki English we use classroom games, the adrenaline pumping of a competitive game is as close as we can get to the adrenaline pumping real life scenario when you first speak the language in real life. Plus with a well crafted game the kids get lots of practice speaking with each other, not just with the teacher. All the main Genki English class games you can find on the website, just pop over to the curriculum page, click through to the lesson you like and off you go! Ninja Tip: There are also more bonus games available for VIP members. And all you need materials wise is the Teacher’s Set. P.S. Timing wise, spend around 3 to 5 minutes on the warm up/review at the beginning, maybe going up to 5 to 10 minutes after a year or so of lessons (as you have so much more to review!) Then split the rest of the time equally between input and output. Unless you are doing the homework programme, in which case of course the kids have already done the input at home so you can whizz through that really quickly (basically just checking they got the meanings right!) and spend more time on the output. Would you also recommend reviewing lessons after, say, a week or a month, to help long-term memory? Would you recommend repeating some lessons after a month or two, or is it better to repeat the language in a different way? I’m still trying to get the timing just right. For my Genki classes (I have one out of my nine) I do the warmup – input – and output in the first 45 minutes and then phonics and reading in the second half with a quick re-singing of the song or a review card game at the end if we have time. Works pretty well. @Susan K: If you follow the “Secret Warm Ups” above you’ll be reviewing everything in every lesson so there’s no need to re-do the lesons as they’ll always remember everything we’ve done before. It’s just like in Karate where even the black belts run through every pattern before starting each session! Yeah, as long as you are constantly reviewing and using the previous material it should stay in memory. I tend to view the card games for fun at the end of class as a way to review things learned previously. And Martin has got some fantastic card games coming up for you all! PRESSURE!!! Haha, maybe I should stop playing video games and get back into work mode.